Thank you for your interest in our site. Our member's area is currently closed for new members. We have not been accepting new memberships for some time - However, we do open our sign-up area periodically for new members. For best streaming and downloading of our videos please use Internet explorer as your default browser. VideoLAN is a software project, which produces free software for video, released under the GNU General Public License. 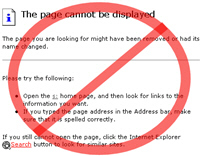 The Page cannot be displayed error message could be due to number of reasons. Before you start, ensure you are connected to the internet. Try getting into other websites. If you are able to, then the problem is with the website, not with your browser. 1. Delete the temporary files and cookies. 2. Check Browser Connection Settings. 3. Do a Ping test. 4. Check for corrupted browser file or TCP/IP. I can not see the videos and/or live feeds. what do i do? Please download the latest version of internet explorer. You can get it here. Your display adapter may only be capable of rendering 256 colors, or, more likely, your display's control panel is set to 256 colors. If that is the case, set your display's control panel to thousands/millions of colors, high color/16 bit or higher. Select "Display" or right-click on the desktop and choose "Properties" to correct the problem. You'll need to quit and re-launch your browser to reset the colors. If your video hardware is not capable of displaying more than 256 colors at your chosen resolution, the video will still work, but it may be oddly colored and/or look slightly fragmented. Sometimes I get error messages, or the video just won't play, what should I do then? Please note: Windows Media Player is required to view the clips. We will NOT refund you if you claim you cannot view our clips. Yes. We mail DVD orders. PASSWORD SHARING is easily detected and those caught password sharing will be blocked without refund! Members who advertise sharing their passwords will have their membership discontinued. IMPORTANT: The HypnoLust.com website and its members area are copyrighted by HypnoLust.com. All photos, videos and clips on this website are the sole property of HypnoLust.com and are intended for private viewing of its members. Any copying or redistribution of the content on this website without the express written consent of HypnoLust.com is a violation of U.S./ International Copyright Laws and is subject to fines and/or prosecution.